Meal sharing is perhaps the oldest form of hospitality in the world. 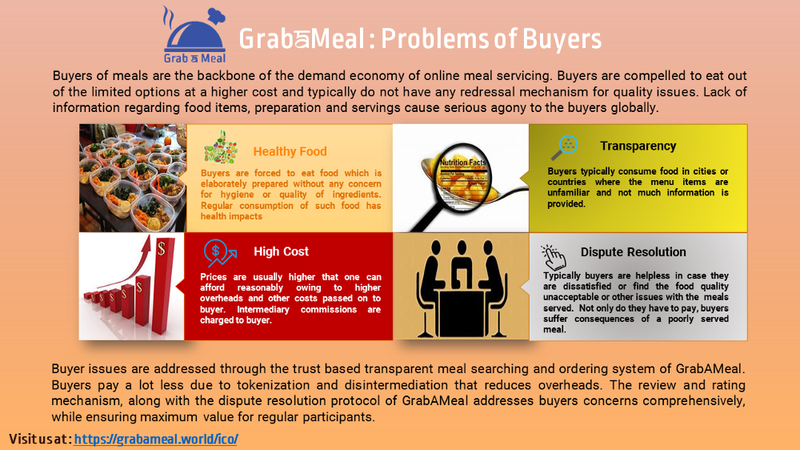 The GrabAMeal project is a peer-to-peer meal sharing platform where food sellers can sell their meals to buyers and food consumers (buyers) will have the flexibility to find healthy home-made meals in their locality from enlisted, reviewed food producers on this platform. 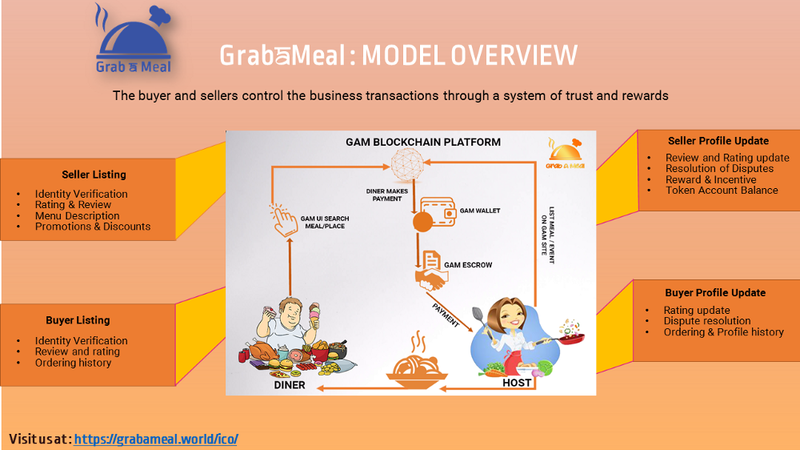 Here everyone can become a buyer or a seller of wholesome meals for others, and all the transactions will be recorded in GrabAMeal blockchain. 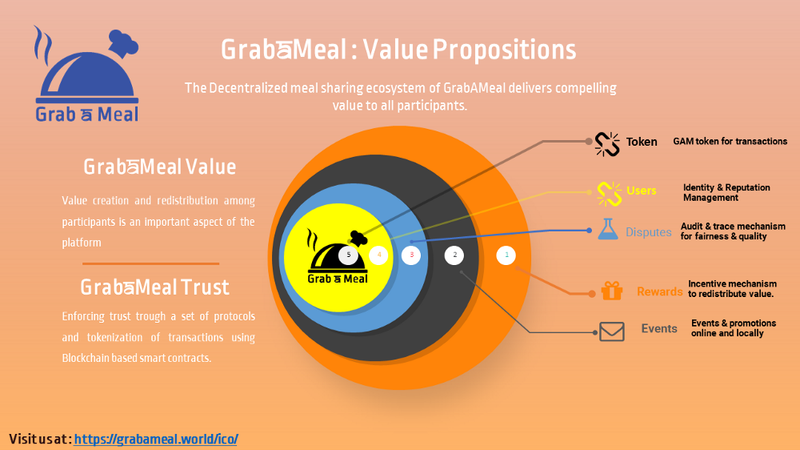 GrabAMeal, The meal sharing P2P platform will involve four categories of participants. These are: sellers (home kitchens, eateries), buyers (consumers), experts (support providers, auditors, and technology experts), ecosystem vendors or associates (suppliers, logistic partners, retailers). GrabaMeal works based on 3 protocols: GrabaMeal Identification, GrabaMeal Dispute Resolution and GrabaMeal Reward. These protocols are based on AI and ML. · The GrabAMeal platform shall identify and validate each and every seller and buyer through a process of verification and trust, by implementing a blockchain based review and feedback mechanism defined in the GrabaMeal Identification Protocol. · GrabAMeal will charge a minimum commission to Buyers or Sellers for GAM token transactions, and will substantially reduce cost of the meals. · A GrabaMeal Dispute Resolution protocol to resolve disputes arising from time to time by engaging other buyers and sellers and independent auditors. · A system of rewards and incentives protocol designed to reward participants with tokens to buyers, sellers and auditors for participating in transactions, disputes and promotional events. 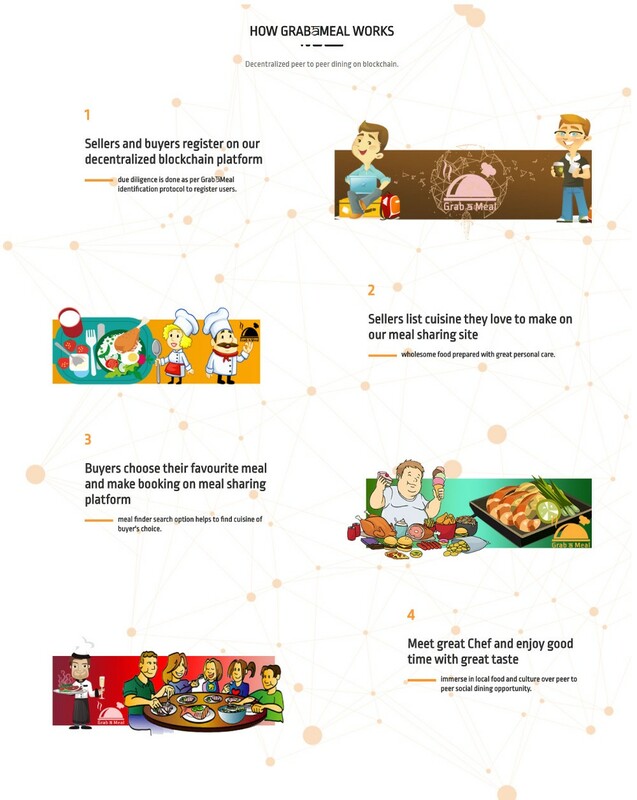 By using the platform the sellers will find an opening to establish a stable business in meal sharing, enjoying a way to utilize their culinary skill as well as to earn money out of this new food sharing business. · They will get to consume quality foods according to personal taste and budget. All transactions on this platform will be done by a crypto-token, GAM. All users of this platform need to have GAM Wallet to do transactions. · GAM tokens will be deposited into the users’ account on the platform. The users can purchase the tokens with Fiat currency from the listed exchanges and can also exchange tokens for fiat currency as needed. · All items listed by sellers will be in Fiat currency denominations and also in GAM token value. The GAM token prices will be dynamic and may get altered from time to time based on the prevailing exchange rates for the tokens in the market. · The ordering of a meal will be completed by a buyer making a payment. GrabAMeal will hold the payment in an intermediary account (escrow Account) till the transaction is flagged off as complete by both the seller and buyer. In case of any dispute, the payment will be held in a separate account, pending resolution of the dispute. · GrabAMeal platform will conduct promotions and content based services for the sellers. · GrabAMeal will include suppliers of ingredients and cooking materials for sellers and buyers by listing retailers and traders qualified by experts. 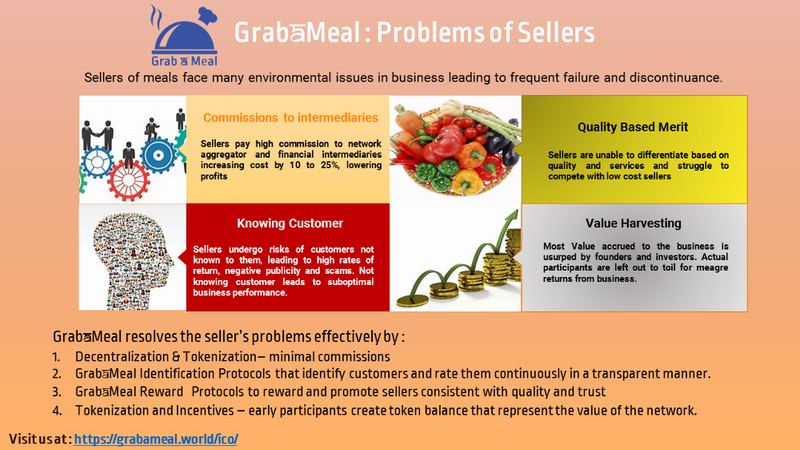 It is anticipated that GrabAMeal will radically transform the meal sharing economy in near future, not only by involving participants in every aspect of the business, but also by creating an end-to-end ecosystem where food supply related services and details of ingredients used in cooking meals will also be included in the food supply chain as deciding factor.